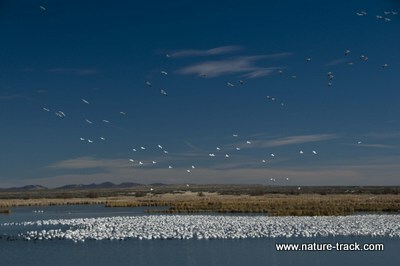 Do snow geese migrate earlier in the spring when conditions allow it? The answer is a definite maybe. I have been anxiously awaiting the return of birds to eastern Idaho. Almost every other day I am at one or more of our wetland areas checking on progress. Bird numbers are increasing slowly and steadily, though not as fast as I would like. With the an early spring, I thought this process might speed up a little and I didn’t want to miss it. However, timing doesn’t really appear to have changed all that much and I wondered why. Wouldn’t it be an advantage to the birds to get an earlier start on migration? After all, finding a prime nesting territory can be a challenge and early arrivals should have the advantage. When I looked into this, it became apparent that there are two extremes of migrant birds. At one end are those for which migration is a genetic or hard-wired process. Called obligate migrants, they are pre-programmed as to when they leave and return, where they go and how they get there. For obligate migrants such as many shorebirds and warblers, resources vary predictably and they take advantage of that. They may leave behind awesome circumstances to begin migrating because the calendar (day length) tells them it is time to go. That is why it is easy to forecast when some birds will be arriving at a given area. Obligate birds are also generally the ones that travel the greatest distances. They may fly from the jungles of South America back to the Arctic. It makes sense then why they are ruled by the clock and not by conditions. They time migration to ensure food and water will be readily available. Once they begin migration, they can’t gamble that conditions will improve. Facultative migrants, are on the other end of the bird migration spectrum. For these travelers, migration may actually be optional, depending on conditions. The timing of their migration in any given year is also highly variable. They are also usually shorter distance migrants. If conditions moderate early in the spring, you may expect facultative species such as sandhill cranes, red-winged blackbirds and killdeer to take advantage of the weather and arrive earlier than normal. How they know whether or not conditions on the migration route are suitable is a good question. They may build their migration in a block of habitat approach: they may assume that if things are good where they are, a couple hundred miles north will be pretty similar. That way they move in spurts but are not too committed if they bump up against the edge of winter. Facultative species also include what are termed irruptive species. These are short-distance migrants that may not typically migrate far or even at all some years, but during food shortages they change this behavior. They may migrate, en masse, to find a new food source. Irruptive species include Bohemian waxwings, crossbills, northern shrikes, snowy owls and great grey owls. Since it is a continuum from obligate to facultative, it stands to reason that not all birds fall neatly into one or the other classifications. There are many birds that will be between the two extremes. So, I had my answer. Will birds migrate sooner during an early spring? The answer is a definite maybe.